The Isle of Anglesey (Ynys Môn in Welsh) is situated off the north-west coast of Wales near the beautiful Snowdonia mountain range. It is separated from the mainland by the Menai Strait, which is spanned by two picturesque bridges, the Menai Bridge and the Britannia Bridge. Anglesey was known as Mam Cymru ('Mother of Wales') during the middle ages because its fertile fields formed the breadbasket for the north of Wales. 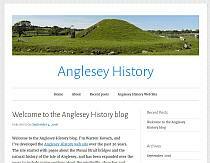 The name Anglesey is thought to have come from a Viking place name. In old Norse the -ey ending indicates an island named after a particular person (cf. Bardsey, Orkney, Ramsey, etc.). Anglesey is probably derived from "Ongl's ey", Ongl's island. Who Ongl was we have no idea. Today it has several thriving towns. The historic town of Beaumaris is the site of one of the castles built by Edward I after his defeat of the Welsh princes, as well as the historic mansion Henllys Hall, now a hotel (see their pages for more on the history of Anglesey and Wales). The town of Holyhead, on Holy Island, is the main ferry port for travel across the Irish Sea to Dublin and Llangefni, in the centre of the island, is the county town. Kovach Computing Services (the host of this site) is located in the village of Pentraeth. Anglesey also has the village with the longest place name in Britain: Llanfairpwllgwyngyllgogerychwyrndrobwllllantysiliogogogoch (click here to hear it pronounced). The name, when translated into English, means "The church of St. Mary in a hollow of white hazel near a rapid whirlpool and near St. Tysilio's church by the red cave". The name was actually coined in the nineteenth century to attract tourists to the Island. It is abbreviated to Llanfairpwll or Llanfair P.G. by the locals. To explore more of our site, click the menu buttons above.